Advocate ; topical application once a month for fleas , several worms and mites, for this purpose ( mange ) often used for puppies of sensitive breeds to prevent or support treatment of the Demodex and Scabies parasite. Defendog ; once a month spray for fleas and ticks and also repellent for flies ; NOT FOR CATS !! 2. Worms ; round and tapeworm ; depending on the lifestyle of your pet ( scavenging , fleas) once every 3 months , Cat living in apartment , no outside access , once a year. Heart worm ; Has not been diagnosed often in the Marbella region but appears to be increasing . 3.Mosquitos ; problem in general between April and November especially in the evening hours , when your pet is a resting target. 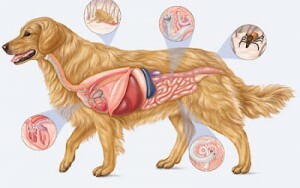 Transmission of Leishmaniosis and Heartworm.